Latest News from Health Benefits Dept. We wish you all the joys of the season and the best for the New Year! And to help ensure that your holidays stay happy, we have included a 2018 Holiday Survival Toolkit, with links to tools on navigating stress, budgets, family dynamics, holiday health and more. While the holidays can be full of rich time with family and friends, they can also be a time of high stress or depression for some, such as those who are struggling financially, those who have suffered a recent loss or any number of other reasons. If you or a family member are experiencing any difficulties this season, large or small, your EAP can help. Remember that your EAP is available 24-7-365 for help with any difficulties you may experience. For confidential help from experienced counselors simply call 800.252.4555. Important Information for NYSHIP Enrollees concerning copayment increases. Anticipating budget or financial problems? 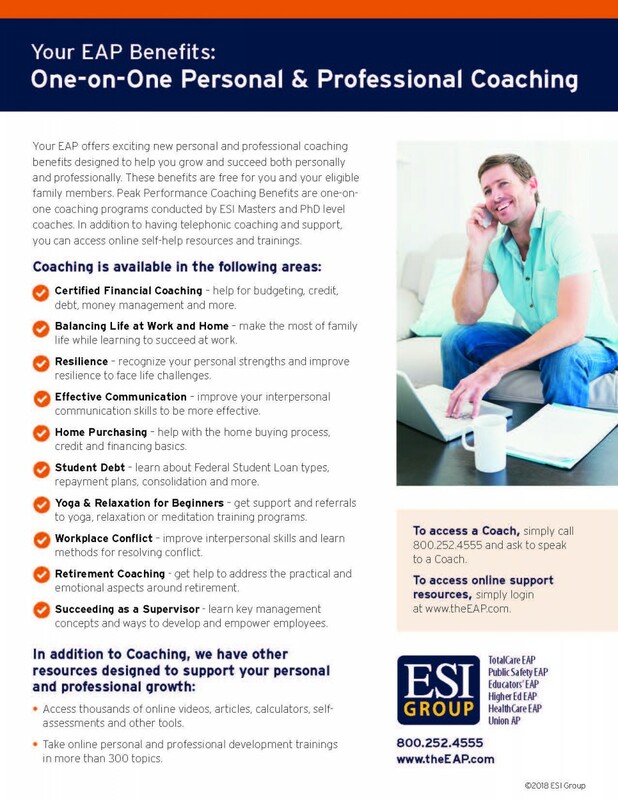 Schedule a meeting with a Certified Financial Coach to discuss your financial concerns, or visit the Personal Finance & Education Center section of your EAP website to view financial tools, trainings and resources! Do you need support in caring for an elderly family member? Utilize our Caregiver Benefits to discuss local resources and information on medical and home care needs with our specially trained counselors! Looking to maintain a healthy weight despite all of the Holiday gatherings? You have discounts available through the EAPâs Lifestyle Benefits for Jenny Craig, LA Fitness, Nutrisystem, and more! Not sure how to navigate the Holidays with your new or anxious pet? Visit the Pet Resource Center on your EAP website to learn more about keeping your pets happy, healthy, and safe! Strapped for time in locating a medical or dental provider? Use the EAPâs Personal Assistant to locate options that will work for you! Would you like to manage your stress level throughout the Holiday Season and beyond? Participate in Yoga & Relaxation Coaching for Beginners, which includes one-on-one telephonic coaching & support! Remember, these services are completely confidential and available to you and your family members, free of charge. Please visit www.EducatorsEAP.com, or call 800-252-4555 for more information. Annual Medical Open Enrollment is happening now……. Medical Open Enrollment is here!! During the months of October and November, District employees have the opportunity to enroll or make changes to their health plans. All changes will become effective on January 1st, 2019. This is the time of year when all benefit eligible employees must complete the open enrollment process. Please be advised that all elections must be made through INAVIGATOR. INAVIGATOR is the new benefits portal and has replaced INROLL. Anyone going into INAVIGATOR for the first time must create a brand new account in order to create a user name and password to log in. Medical open enrollment ends on November 30th, so please be sure to complete the open enrollment process before the deadline. September 4th- September 25th, 2018 is open enrollment for the District’s Flex plan administered through Wage Works. Enrollment is optional; however if you are interested you must enroll during the designated open enrollment period. You will not be able to enroll once open enrollment has ended. The plan year will begin on October 1st, 2018 and runs through September 30th, 2019. We offer FSA (Flexible Spending Account) Unreimbursed Medical Expenses and DCA (Dependent Care Account). The maximum amount this plan year for FSA Unreimbursed Medical is $2650.00. The maximum for DCA is $5000.00 per household. Enrollment must be completed through INAVIGATOR. September is also the open enrollment month for Aflac. This is the time when you can add or drop an Aflac policy. Information is available on INAVIGATOR. Please check your 9/4 email for enrollment details. Beginning on Monday, May 14th we will be using INAVIGATOR, a new benefit portal that will replace INROLL . All benefit eligible employees will receive an email on Monday, May 14th, 2018 regarding registering for the new portal. Anyone who is participating in the 2018-2019 Health Insurance Buy-Out will need to complete the registration process beginning May 14th and ending June 30th. We will then have subsequent email reminders about our open enrollments for the Flex plan during the month of September and our medical open enrollment during the months of Oct-Nov. Employees not taking the health insurance buy-out can register for the new portal now or when they want to participate in a particular optional open enrollment such as the Flex plan; however everyone who is in a benefit eligible position, will be required to register for the new portal and complete the medical open enrollment during the months of Oct-Nov. Please see the link to the INAVIGATOR Registration page and the Employee guide. Dear Employees, beginning January 1st, 2018, Marshall and Sterling will be our Broker of Record for health benefits. If you have questions or issues with you MVP PPO, MVP HRA, MVP HMO, CDPHP HMO, or GHI/HIP HMO, Marshall and Sterling has a customer service team that is ready to help. Their team is available to help you and can assist with questions on benefits, claims, deductibles, etc. Please see this list for contact information . If you are considering retirement in the near future or just want to plan ahead and have some of your retirement questions answered, NYSTRS offers personal benefit consultations and group seminars focused on retirement planning. Please visit NYSTRS.org to review the 2017-2018 Benefits Consultation and Fall 2017 Pension & Retirement Education Program (PREP) schedules. Reservations are required and you should bring your latest Benefit Profile with you to the seminar. The schedule is accessible through the Retirement Planning page. Make reservations at NYSTRS.org using your MyNYSTRS account or you can call -800-348-7298 ext. 6180 M-F 8:30am to 4:15pm. Open enrollment for the District’s Medical Plans will run from Sunday 10/1/17- Thursday 11/30/17. Everyone who is eligible for medical benefits, including anyone who participates in the Health Insurance Buy-Out must participate in the Open enrollment process. You will have the option to enroll in Medical Plans through NYSHIP, MVP, CDPHP or Emblem (HIP) or if you have elected to buy-out, you will select the option to waive coverage. The District will once again be using an on line enrollment procedure utilizing the benefits portal through InRoll+ and U.S. Employee Benefits. In order to complete the open enrollment requirements, you will need to go to their link https://www.inrollplus.com. If you need assistance navigating INROLL, please download the INROLL guide We will also be offering sessions at the Newburgh Free Library’s E-Learning Center for those without computer access or for those who need assistance on the following dates: Monday, 10/16 and Tuesday 10/17, Monday 10/23, Monday, 10/30, Monday 11/6, Monday 11/13, Monday 11/20 and Tuesday 11/21. Registration is required. Please go to https://www.newburghschools.org/inroll to pre-register for a session. There will be three sessions held on each day from 4:30-7:30 pm. Each session will last approximately one hour and each session is limited to 15 participants. If you used InRoll+ last year, your username and password are the same. If you have forgotten either your username and/or your password, there are links you can click to help you recover them. If you were hired before 9/1/16 and have never logged in to InRoll+ before, you will need to use 9/1/1980 as your default birth date when logging in for the first time. Once you are logged into the system, you will be asked to create a User Name and Password. When you arrive at the Welcome Screen, you should then go into Manage Profile to update your date of birth. You can then make your ANNUAL elections for your Medical Plan. The plan year runs from 1/1/18-12/31/18. The InRoll+ portal will be open for Medical enrollment during the open enrollment period 10/1/17-11/30/17 and it will then be closed. The portal will then remain open for any Changes of Family Status requests that may occur throughout the year such as a marriage, births, address updates, etc. and for new hires to enroll in an insurance plan. If you have any questions regarding Open Enrollment, please contact Keisha Martinez at (845) 563-3467. If you have any questions regarding InRoll+, please contact Kristen Coolbaugh, U.S. Employee Benefits 1-855-562-7821 x102 or Katy Murray, U.S. Employee Benefits 1-855-562-7821 x111. Open enrollment for the District’s Flexible Spending Account (FSA) through Wage Works will run from Friday 9/1/17- Monday 9/18/17. You will have the option to enroll in Flex for Unreimbursed Medical Expenses, Dependent Care or both. This year, the District will once again be using an on line enrollment procedure which will eliminate the paper enrollment form or Salary Reduction Agreement (SRA). The District will be utilizing the benefits portal through InRoll+ and U.S. Employee Benefits. In order to enroll in the Flex Plan this year, you will need to go to their link https://www.inrollplus.com. New for 2017: The maximum annual contribution amount for Unreimbursed Medical Expenses is now $2600.00. Spouses are allowed to contribute up to $2600.00 each annually. The contribution for Dependent Care Expenses will remain the same at $5000.00 annually. The June 2017 Issue of Lifestyle Tips is now available to download. The 2017-2018 Health Insurance Buy-Out Forms are now available in the main office of each school building and also can be downloaded from the Health Benefits page of the District's website. Please be sure to complete both the Buy-Out Form and the Declination of Health Insurance Form and attach a copy of your current health insurance ID card. Any one interested in participating in the Buy-Out must submit new forms for the upcoming school year. All forms are due by Friday, June 16th, 2017 and should be returned to the Health Benefits Department. Use the following link to download the latest edition of the EAP Promo Newsletter. Important Information from the New York State Teachers' Retirement System: The Winter-Spring 2017 Schedule of PREP Seminars (towards bottom of page) has been issued by NYSTRS. PREP seminars are free and sessions are held throughout the year in New York State. Instructions for making reservations are included in the schedule. The November issue of Lifestyle Tips magazine is available now. All FT Benefit eligible employees must complete the open enrollment process through INROLL by November 30th, 2016. There are INROLL webinars scheduled the week of 10/17/16-10/21/16 from 4-8pm and the week of 11/1/16-11/4/16 and also on 11/30/16 from 4-8pm. The sessions run by the hour. If you need assistance with the open enrollment process or if you have already attempted the open enrollment process and want to confirm you have completed the process correctly, please log in to the INROLL webinar using the following information: https://video.togethertalk.com/#m=95368731. Webinar participants can call in at the following number 1-877-366-0711 Access Code 23400691. If you would like to sign up for a hands on INROLL training session, please visit www.newburghschools.org/inroll to sign up for a 1 hour session or call ext 33467 to enroll if you do not have internet access. These sessions are being offered at the Newburgh Free Library E- learning center on 10/24/16 and 10/25/16, 11/7/16 and 11/8/16, 11/14/16 and 11/15/16 and 11/28 and 11/29/16 from 4-8pm. Each session is limited to 15 people. Computers will be available so you can receive assistance with completing the open enrollment process. A downloadable version of the 2016-2017 MVP PPO Benefits Guide is available for download below. Important requirements for all FT benefit eligible employees 2016-2017 INROLL Open Enrollment information and instructions. Here is a copy of the 2016-2017 schedule of building visits for Aflac. Representatives will be visiting each building during the month of September. The 2016-2017 Open Enrollment period for the Flex Plan will run from Thursday, 9/1/16- Friday, 9/23/16. This year, we are eliminating the paper enrollment forms and will implement an online enrollment through our new benefit portal, INROLL. The portal will be open for Flex Plan enrollment during the open enrollment period and will then close on the 9/23/16 deadline date. It will reopen during our open enrollment period for your other benefit needs. If you are interested in enrolling in the Flex plan, please be sure to enroll online at https://www.inrollplus.com. Also here is the full FLEX plan information and the INROLL Employee Guide. MVP is in the process of sending all MVP PPO plan enrollees new MVP Insurance ID cards. The new cards have an effective date for the new plan year of August 1, 2016. You can discard your old MVP ID card and begin using the new MVP ID cards on August 1st, 2016. You should continue to use the old MVP Health Insurance ID cards until August 1st, 2016. Please be advised that you will not receive new HRA debit cards. You should continue to use your current HRA Debit Card. Plan deductibles will renew on August 1st, 2016. Below please find a link to the health insurance buy-out form. Please note that the Health Insurance Buy-Out forms must be completed by anyone wishing to participate in the Health Insurance Buy-out for the 2016-2017 school year. In order to verify current health insurance coverage, a copy of your current health insurance card must also be submitted with the completed forms. All forms must be returned to the Health Benefits Department by Friday, June 17th, 2016. Download Buy-out form. Letters have gone out regarding our insurance broker change which will become effective on March 1st, 2016. If you are enrolled in the MVP PPO plan and did not receive a letter, please be sure to download a copy. This Health Insurance Enrollment/Declination form must be completed by all FT employees who are either enrolled in a District health insurance plan, participate in the Health Insurance Buy-out or have elected to opt out of both the District insurance and the Health Insurance Buy-out. Forms are due by Tuesday, March 1st, 2016 and should be returned to K.Martinez in Health Benefits. MVP PPO Account Setup & HRA Mngm.